VERITAS Software products, such as VERITAS Volume Manager (VxVM) and VERITAS File System (VxFS), are popular on other UNIX platforms, and VERITAS announced these products for AIX in the early of May 2002. VERITAS Foundation Suite for AIX includes VERITAS Volume Manager for AIX and VERITAS File System for AIX. These products will be useful for people who are familiar with the same products on other UNIX platforms since VERITAS Foundation Suite for AIX provides a similar environment for them. That means they can use their same skills and knowledge in the AIX environment. 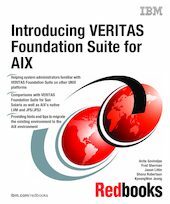 This IBM Redbooks publication will not only help system administrators who are familiar with VERITAS Foundation Suite on other UNIX platforms but also AIX system administrators who are familiar with AIX’s native Logical Volume Manager (LVM) and Journaled File Systems (JFS) and would like to learn more about VERITAS Foundation Suite for AIX. This book will compare VERITAS Foundation Suite for AIX with VERITAS Foundation Suite for Sun Solaris as well as AIX’s native LVM and JFS/JFS2. One of the main focuses is the procedures, hints, and tips to migrate the existing environment to the AIX environment. It will also cover all the details about the functionalities of these products, including planning, installation, configuration, administration, performance, tuning, and troubleshooting. This book also introduces VERITAS Cluster Server in Appendix D for those interested in setting up a clustered environment.